High quality dashboards utilizing our patent-pending DashXL™ technology. DashCommand™ comes with pre-loaded dashboard skins for both portrait and landscape modes. The DashXL™ skin sets include multiple dashboards with buttons to navigate between them. 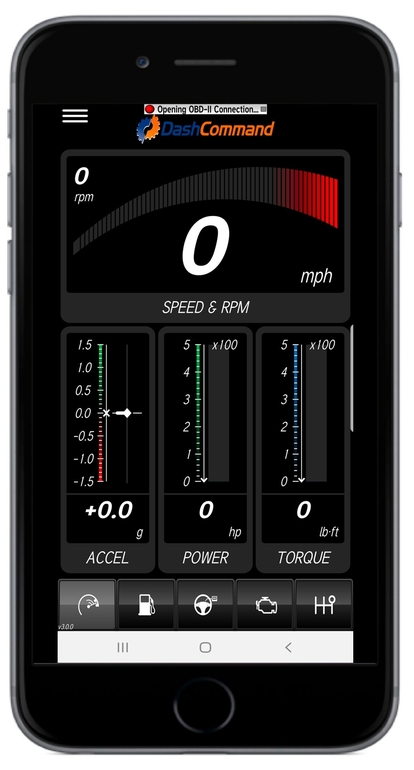 Each dashboard features a different gauge layout, so you can choose the right one for you. These dashboards are built using our DashXL™ editor (accessible from the Tools menu of any of our freely downloadable Windows software applications). Using the DashXL™ editor, you can design custom dashboard layouts, so you can make them look just the way you want (and even share them with your friends)! Professional skidpad showing real-time lateral, acceleration, and braking G forces. Clearly marked G-force circle visually plots the G forces and keeps a record that you can instantly understand. It also features indicators showing your maximum left, right, acceleration, and braking G forces. 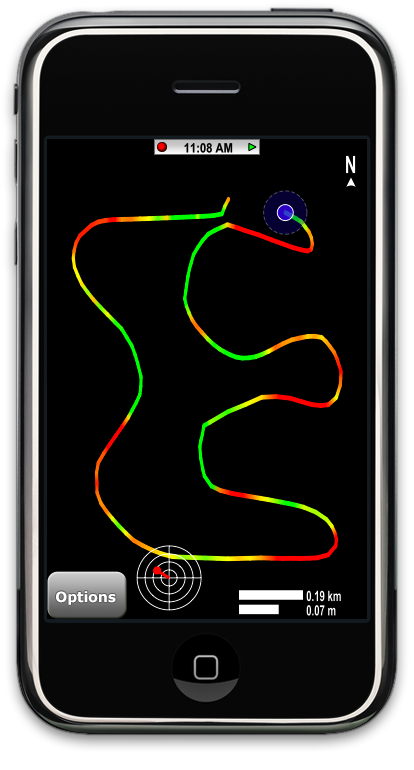 Visually maps out your path as you drive around the race track. 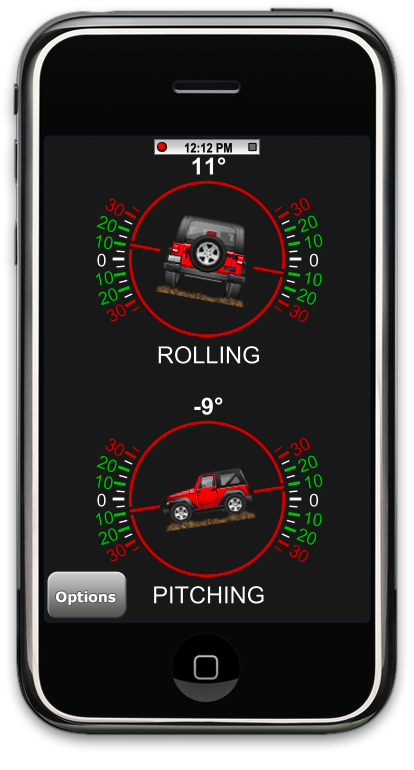 Displays your current location and whether you are accelerating or braking in clear and easy to see colors. 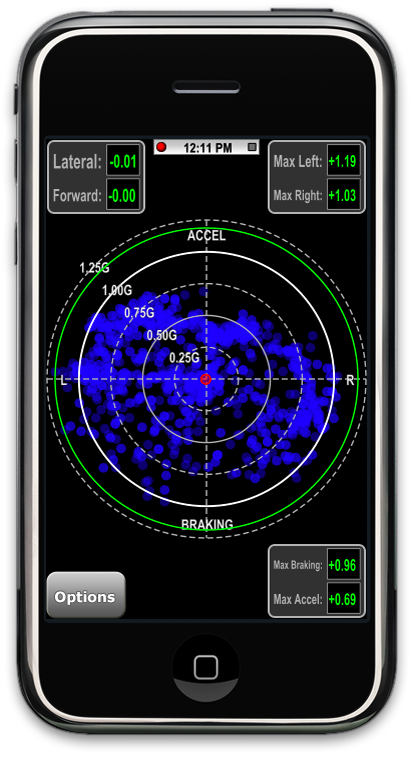 Visually analyze different race track laps to see how acceleration and braking changed from lap to lap. Do you like to go off-roading or rock crawling? 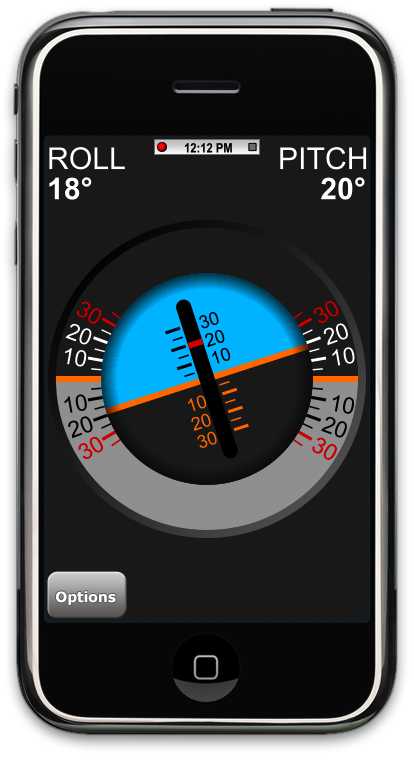 The inclinometer functions as both a tilt meter and a slope meter. Give yourself a little more confidence when off road, showing the roll and pitch attitude of your vehicle. Handy in terrain where the horizon is not horizontal or when wheeling at night and you can’t get a good visual reference. Easily toggle between two different modes of display.